Senior staff at Inverness College UHI have received a preview of the College’s new state-of-the art facility at Inverness Campus when Miller Construction’s team removed scaffolding to reveal impressive Jura limestone cladding. 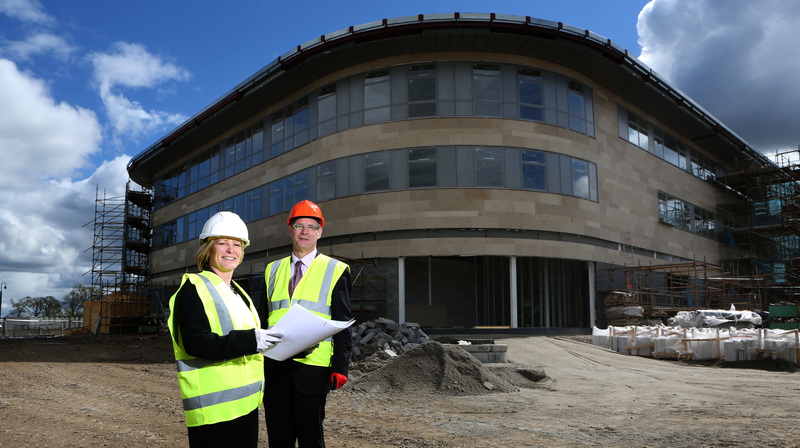 The College, which is home to more than 6,000 students, is set to relocate to its new facility next year and will be the first and largest occupier at the 215 acre multi-stakeholder Inverness Campus site. Construction work has now reached the half-way mark, which means the building is well on track to welcome its first students in August 2015. Diane Rawlinson, principal and chief executive, said: “The new building couldn’t be more different from the block on Longman Road. The multi-million pound Inverness Campus development which provides the setting for Inverness College UHI’s new buildings is a stunning modern environment designed to inspire and motivate students and all who visit us.